[Episcopal News Service] It’s never polite to upstage the newlyweds, but when the royal couple invited Presiding Bishop Michael Curry to deliver the sermon at their wedding on May 19, they surely knew that the leader of the Episcopal Church was bound to generate headlines of his own. “The surprise star of Harry and Meghan’s wedding” is how the Washington Post’s headline described Curry. The New York Times described it as a “searing, soaring” sermon about the power of love. 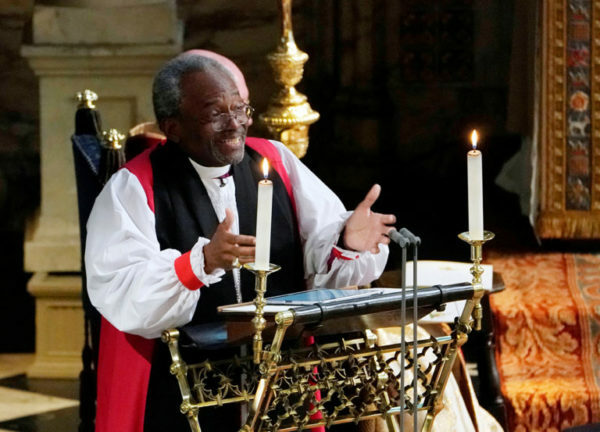 “With its repetition and emphasis, his sermon drew upon the devices of black ecclesiastical tradition,” the Times wrote, calling it a “striking contrast” to the bishop of London’s sermon at the 2011 royal wedding. The sermon itself never strayed far from the theme of love, even as Curry incorporated references to both the Old Testament and the Rev. Martin Luther King Jr., as well as black spirituals. 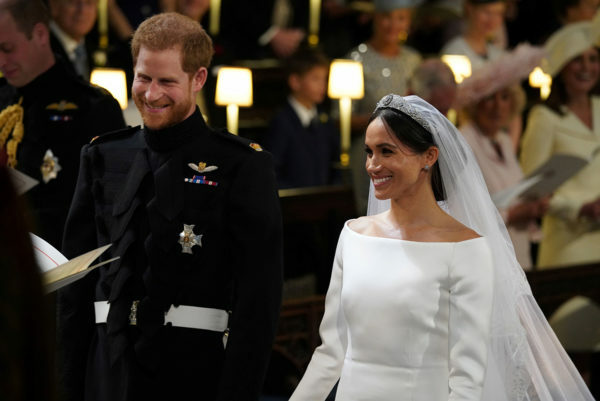 The message appeared to resonate with the royal couple, with Prince Harry at one point wiping tears from his cheeks while his bride’s smile widened. The media attention on Curry’s sermon had been intense since the moment on May 12 that he was announced as preacher. It was an unexpected choice, given that royal wedding sermons typically are delivered by clergy in the Church of England, which, like the Episcopal Church, is a province of the Anglican Communion. Much of the reaction focused on the fact that Markle is a biracial American actress and on Curry’s status as the Episcopal Church’s the first black presiding bishop. In the flurry of news stories about Curry leading up to the wedding, he sometimes was mistakenly identified as a “Chicago bishop”– he was born in Chicago but grew up in Buffalo, New York – and confusion about church hierarchy and titles may have played a role in some outlets diminishing Curry slightly, as merely “a black Episcopal priest,” for example. As the buzz grew leading up to the ceremony, Archbishop of Canterbury Justin Welby called Curry a “brilliant pastor.” Afterward, Welby, who officiated at the wedding, told Sky News he had spoken to members of the royal family, whose reaction to Curry’s sermon was overwhelmingly positive. The sermon even caught the attention of NBC’s “Saturday Night Live,” which dressed up cast member Kenan Thompson as Curry for a short parody during the “Weekend Update” sketch on May 19. Curry gave his own take on the wedding and his sermon during an appearance the next day on NPR’s “Weekend Edition.” The sermon took its cues from the Bible passages that the couple chose, though he also hopes the message resonates beyond the walls of St. George’s Chapel in Windsor Castle. 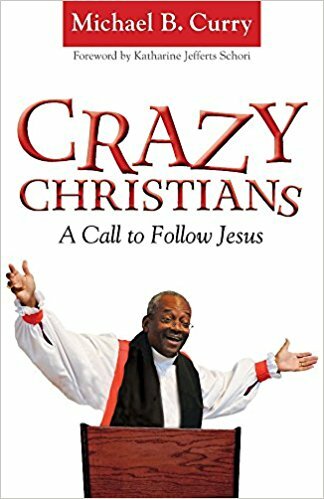 The cover of “Crazy Christians,” a book written by Presiding Bishop Michael Curry. The global exposure generated by Curry’s sermon already has brought renewed attention to his two books, “Crazy Christians” and “Songs My Grandma Sang.” It also could create unique opportunities for evangelism by the Episcopal Church, and some congregations say they already are seeing a modest impact. St. Paul’s Episcopal Cathedral in San Diego, California, posted a Facebook ad linking to Curry’s sermon for the 24 hours leading up to its 10:30 a.m. service on May 20. During the service, “I asked if anyone had come because of the sermon. Three young people in the back waved their hands,” St. Paul’s Dean Penny Bridges said in an email. Some Episcopalians have been reacting to Curry’s sermon on social media by using the hashtag #proudEpiscopalian, and St. Bart’s Episcopal Church in New York is hoping the excitement will increase turnout at the congregation’s “Bring a Friend to Church Sunday”on June 3. “We are now developing messaging that encourages parishioners to invite friends who may have been inspired by Bishop Curry’s preaching on Saturday,” said Kara Flannery, the congregation’s director of communications. Two weeks earlier, Curry had spoken on discipleship at the Episcopal Church of the Good Shepherd in Austin, Texas, the city where General Convention kicks off on July 5. So it seemed natural for the Rev. Morgan Allen, rector of Good Shepherd, to make Curry’s royal wedding sermon the focal point of his own sermon on May 20. “Wow, what a weekend to be Episcopalian!” Allen said.